The New Poldark ..... Loving it! So, come on everyone. On this grey, gloomy day who would like a nice little picture to brighten things up a bit? The new series of Poldark started on Sunday and having never watched the original series, I thought I would give it a go and see if it was as awful as the Jamaica Inn series was. All I can say is ........ YUMMY! Extortionate Garage Costs and Some Thrifty Food. Last week, I noticed that my hand brake had become very floppy and that it needed to be pulled up very high in order to for it to stop the car rolling away so today, I took it to the garage to get them to have a look at it and tell me when they could fit it in. I was absolutely HORRIFIED when I was quoted over £700 to have it fixed! I cannot believe it is so expensive to get a hand brake fixed. I was told that this is the worst case scenario, where the callipers, cables and pads all need replacing and that it might not be that bad but, by the gloomy mutterings of the mechanic coupled with the ominous rubbing of his chin, it's not looking hopeful that there will be a happy outcome to all this! I didn't even know hand brakes had callipers and pads! 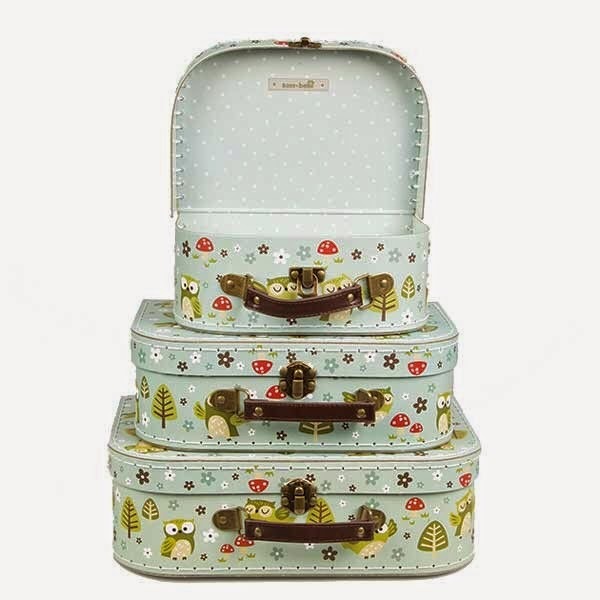 The best case scenario is still £200 and as I said, I'm not holding out much hope that this will be the case. I realise that cars need to be maintained and that things break and wear out but £700? Is it me or is that just ridiculous? Just to make sure I wasn't being ripped off because I am a woman and believe me, this has happened to me in the past, I rang another garage and described the problem over the phone and they confirmed that if the callipers have seized and it needs new cables and pads, the £700 is about right. I am totally devastated because once again, my greenhouse money is going to have to be spent on something else. Just when you think things are starting to get better ..... whammo .... something else comes along to mess things up! Sooooooo, frugal and thrifty to the rescue ....... yet again! At the end of February, I rather rashly bought a bag of spuds from my local Morrisons because they were half price and were a bargain. I don't usually eat a lot of potatoes but at £2 for 12kgs I was sure there was something I could do with them. I love shepherds pie and sausage and mash and lovely warming, rib-sticking meals so I grabbed my spuds and off I went. Because they were half price, they went out of date fairly quickly but by storing them in the dark in my hall-way, which is cold, they are still almost perfect with no sprouting triffid bits and just one or two that had gone a bit soft, which I threw out. They have been sat in the hallway, waiting patiently for me to do something with them and today, after my shock garage visit, I decided I had better do something with them because after I pay for the car there isn't going to be very much left for anything else! Luckily, in my weekly shop I had included some leeks, double cream and low fat creme fraiche because the plan had always been to make some cheesy leek and potato gratin to put in the freezer. So, after pulling myself together and having a good strong cup of tea to get over the shock, I got cracking with the cooking. After peeling what seemed like a galactic quantity of spuds but which still left me with at least a third of a sack, I par-boiled them and left them to cool. While they were cooling, I fried some leeks in a little butter until they were tender but not too soft and again left them to cool. Then I assembled my gratin. Firstly I did potatoes, leek and cheese with a dollop of creme fraiche and a glug of cream. When I ran out of leeks, I did potato and cheese with creme fraiche and cream and when I ran out of cheddar, I used leftover bits of brie and garlic and herb roule that I had left over in the fridge and they were looking a bit past their best. The last of the potatoes I just popped into the foil trays added some salt pepper and butter so that I can just simply put them in the over and use them as roast potatoes. 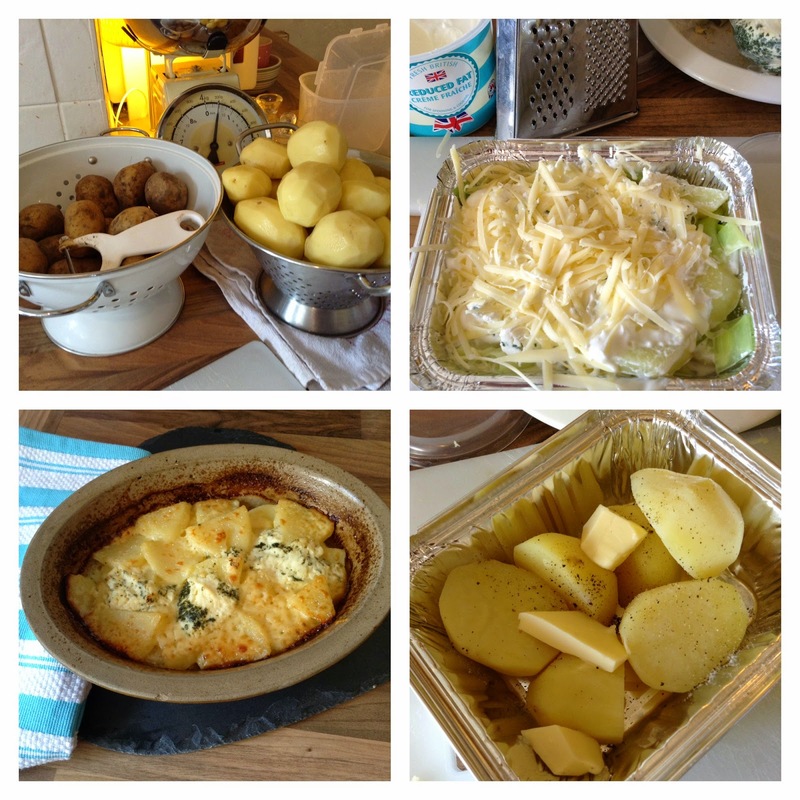 In total, I made three single potions and three double portions of gratin to freeze, a big pie dish full of gratin for my lunch ..... quality control is essential ..... and three portions of roasting potatoes, all for a grand total of £3.86. Well, it's been a couple of weeks since I posted last. It's been a busy time, during which I turned 50 ....... nicer than I thought it would be, had a hospital appointment for my knee ..... a mean doctor who wrenched my knee, made me cry and then diagnosed a severe arthritis flare up and referred me for physio and I have continued to tame my out-of-control house ....... many, many trips to the tip to get rid of all the rubbish accumulated over 11 years of living here and finally starting to see the light at the end of the tunnel. 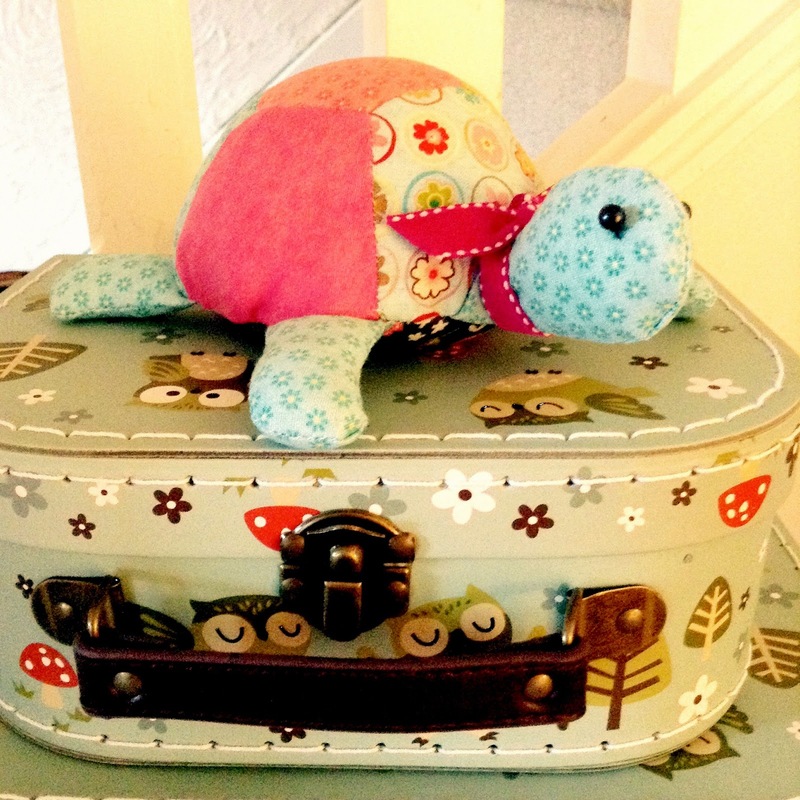 I also did the first piece of sewing since giving up may market stall a month ago. I made this little chap. I have also been making lots of thrifty food. My local Aldi were selling aubergines for 39p each so I bought a couple along with some courgettes and peppers and made some delicious ratatouille and some roasted vegetable lasagne. I made three large portions of each for the princely sum of £4.52. Total bargain and I love the feeling that I am filling up my freezer for the times when money is tight. I realise that some people think I mad, getting excited about being able to live on very little money but I get an enormous amount of pleasure from coming up with delicious food and money saving ideas. Weird I know but there you are. 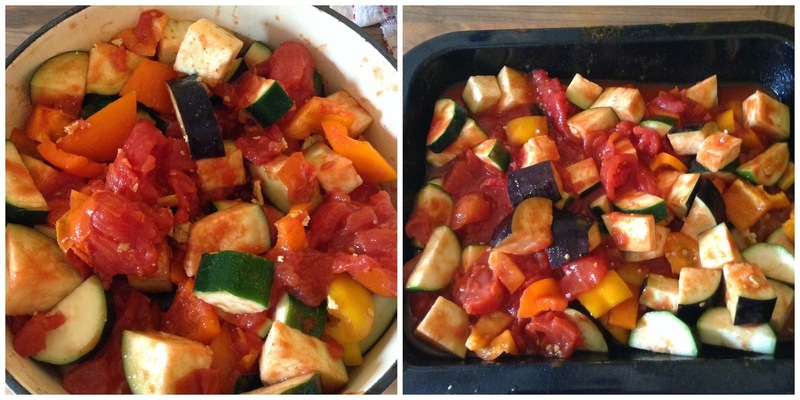 Three courgettes, six peppers, two aubergines and 4 cans of tomatoes made all this roasted veg. I have also managed to tame my unruly sewing corner. Even though I have 3 spare bedrooms that I could take over to use as a sewing room, I like doing my craft and sewing in my living room. It's a big living room, about 35 feet my 15 feet so there is plenty of space but the thing I struggled with was keeping the space looking relatively tidy. I also needed more light so, I sorted out the storage issue with some oh-so-cute mini storage suitcases for things like embroidery thread, buttons and trimmings and some white baskets that I re-vamped with some white paint and a new anglepoise lamp. I have to say ...... 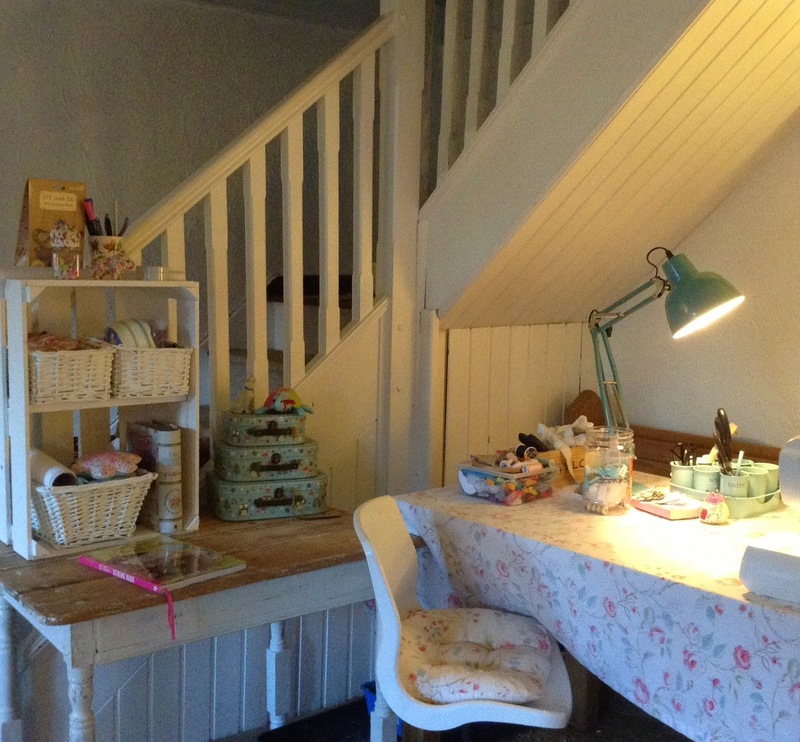 I am totally loving my new sewing corner.